The Madagascan Flufftail is endemic to Madagascar and occurs in the east. It frequents a wide variety of habitats such as degraded and intact humid areas, grassland at forest edges, grassy marshes and secondary bush. It is very secretive but fairly vocal, with high-pitched, ringing voice unusual among flufftails. It feeds on insects and seeds found on the ground. It spends long periods among thick vegetation and is often reluctant to flush. The Madagascan Flufftail is not globally threatened with currently stable population. 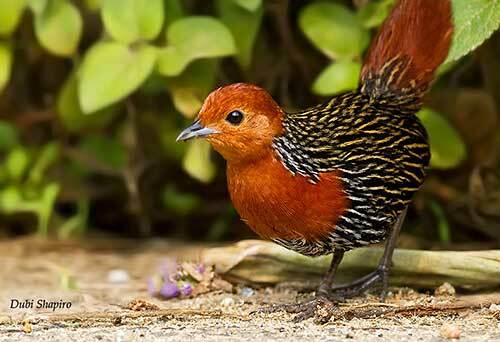 The Madagascan Flufftail is a small bird. The adult male has rufous-chestnut head, neck, breast and tail. Head sides, chin and throat are slightly paler. The plumage of the body is blackish and regularly streaked buffy-white on the upperparts, and streaked white on the underparts. The undertail-coverts are chestnut. The underwing is blackish-brown but the axillaries have yellowish fringes. On the upperwings, flight-feathers, primary coverts and alula are dark brown, but with buff fringes to coverts and alula. The bill is black to dark grey, with paler tip. The eyes are dark brown. Legs and feet are dark grey-brown, yellowish-brown or pinkish-brown. The adult female lacks the bright chestnut colour. She has dark brown upperparts with variable buff or chestnut streaks. Rump and uppertail-coverts are barred cinnamon-buff. The longest uppertail-coverts and the rectrices are deep chestnut with blackish bars. The underparts are pale buff with upper breast and breast sides spotted/streaked blackish-brown, whereas lower breast, flanks and thighs are barred dark brown. The juvenile is duller with dark sooty-brown colour overall. Breast and upper belly are sooty and spotted white, whereas the lower belly is uniformly sooty. The tail is rufous. The male juvenile shows some rufous feathers on head and breast. The Madagascan Flufftail is found in E and C Madagascar. It is restricted to wet areas in N, but it is absent from Lake Sahaka in far NE. The Madagascan Flufftail frequents a wide variety of habitats such as grassland at forest edge, clearings of both primary and degraded forests, secondary bush with large ferns and thick grass, and dense cultivation. It also occurs in vegetated marshes with long grass, reeds and sedges, and in ricefields. The species is visible from sea level up to 2,300 metres of elevation. The Madagascan Flufftail is usually vocal all year round and it can be heard throughout the day. The common call is a loud, high-pitched, ringing series of repeated “kee” or double “keekee” lasting 20 seconds. This series may be preceded by short trills “drr-drr” and often ends with repeated “kik” or “ki” notes. Other calls are shorter versions of this series. During the copulation, the pair gives short “ii…ii…ii”, and some other soft calls can be heard around the nest. 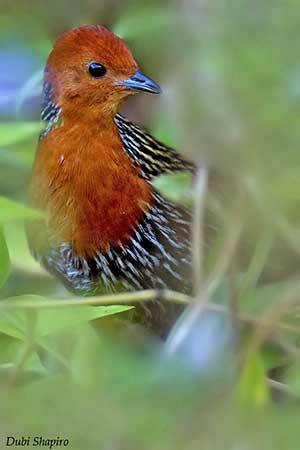 The Madagascan Flufftail feeds on small insects and seeds. It also ingests small gravels or stones to help break up food in the gizzard. It forages in thick vegetation on the ground. It is found alone or in pairs. This species is presumed to be monogamous, territorial and solitary nester. From an observation, copulation was seen during the nest building, but without any display. A short call was heard “ii…ii…ii” while the birds were mating. Actually, the male builds the nest and the female remains in the vicinity and visits it several times. Copulations occurred several times after the materials were positioned on the nest. The birds were mating on a small nearby branch. Then, the male continued the nest-building. The Madagascan Flufftail is sedentary on the island. It is usually reluctant to fly. If flushed, it takes off and flies only over a few metres before landing, and it disappears immediately into the thick vegetation. The laying occurs in February in NE, and in October in S Madagascar, during the local wet seasons and probably in September too and possibly in July. 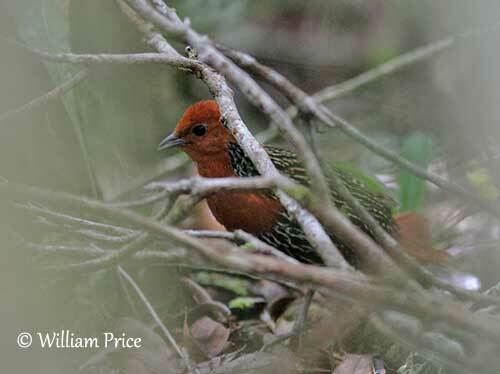 The Madagascan Flufftail builds a domed nest rather than a cup-shaped structure. It can be placed on the ground, or in tussock or up to 160 centimetres above the ground. The nest-site is among thick vegetation, in grassy fields or marshes. The nest is made with woven broad grass blades and thickly lined with finer grasses. There is a circular lateral entrance. The nest is built by the male while the female remains in the surrounding. The male collects the material close to the nest with the bill. This work may last up to three days. The female lays 3-4 white eggs. The incubation is probably shared by both adults. At hatching, the chicks have sooty down. The young may remain with parents after start of post-juvenile moult. The Madagascan Flufftail is widespread and relatively common over most of the range, but its secretive habits make it very difficult to find. The population appears to be stable and the species has wide range. 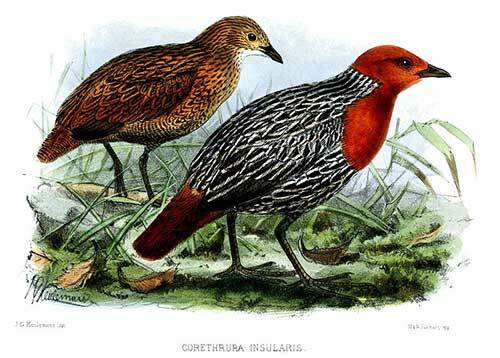 The Madagascan Flufftail is not globally threatened and currently evaluated as Least Concern.